This is the largest Ramsar Site in the world, this is being mentioned in the visitor information centre. The Ramsar Treaty is a intergovernment agreement to protect wetland (fresh and sea water) to promote conservation as well as the wise use of such ecological site. In this website is listed all the 159 signatories to this treaty, unfortunately I was not able to located Singapore among them. 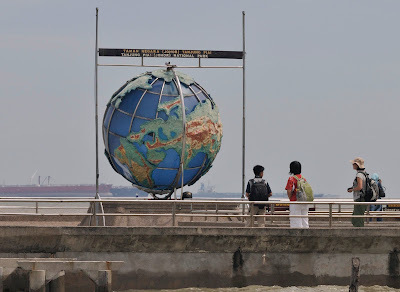 Tanjong Piai is also the most southerly tip of Peninsular Malaysia, and is also known as Cape Piai, this is where the Strait of Malacca joins with the Strait of Johor. 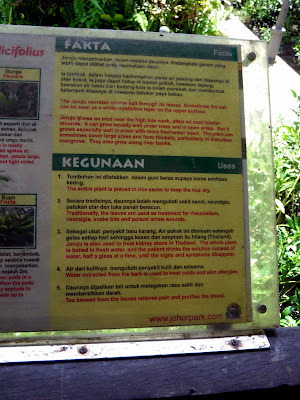 Welcoming visitor to the entrance of the board walk, is a big growth of Sea Holly (Jeruju Putih Acanthus illicifollius). A plant that grow very well in the mangrove area, and more so when there are fresh water. The medicinal value of this plant is described on this vertical board. In the park, there seem to be a marked absence of insects. There were flies, wasps but no constant whirring of cicada. 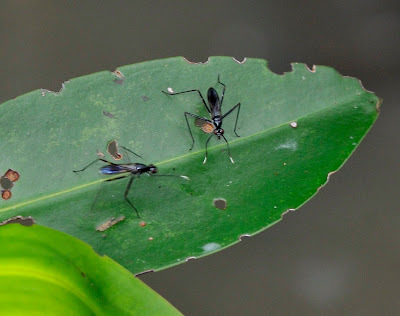 Came upon this pair of insect which I have seemed previously in another blog, these insects looked like they were sparring with "boxing gloves". 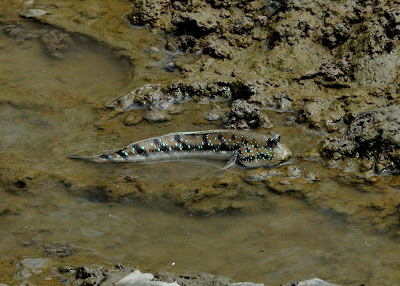 Blue Spotted Mudskippers (Boleophthalmus baddarti) abound in this area, notice the extra long dorsal fin - this is the male. When courting or showing aggression it will lift this dorsal fin. 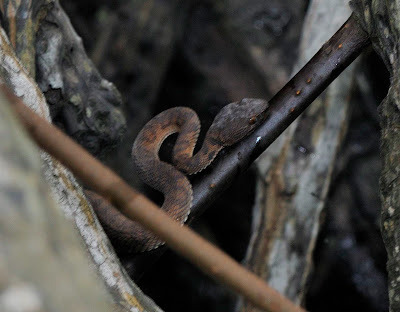 On one of the Bruguiera root, was a juvenile Mangrove Pit Viper (Trimeresurus purpureomaculatus) resting or sunbathing. 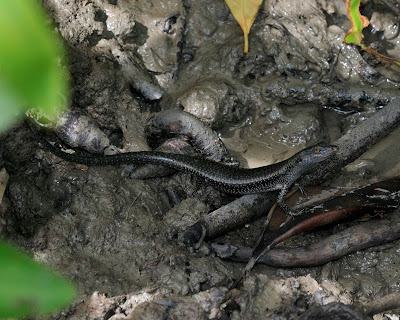 According to literature, this snake can be very unpredictable and is also very poisonous, however for today when this picture was taken, it was in a very lethargic mood! 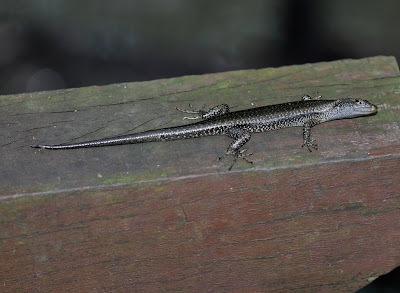 We were fortunate to caught sight of the skittish and shy Mangrove Skink (Emoia atrocostata), and apparently they are not shy here, as we saw many of them, and some of them were so near to us. 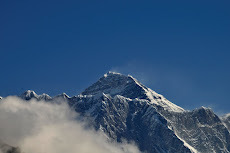 Unlike in Singapore, where a sighting of such a specimen would have been a rare occasion! 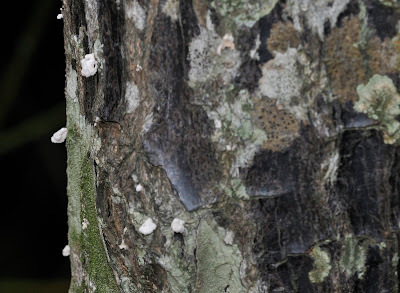 On the bark of many trees, we noticed white blotches and possibly lichen growing on the trunk, but what captivated me was the fungusgrowing on the bark. 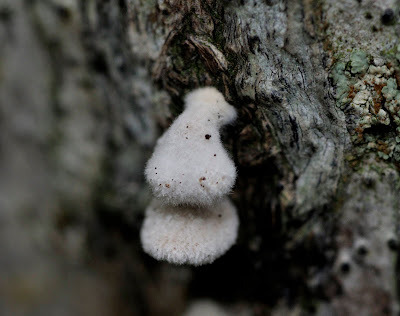 On close inspection - it was some kind of fungus with fuzzy ball. It was definitely a great change and exposure coming here, though the organism here were very similar to back home, but somehow the behaviour, abundance and different setting give a very different perspective to the way we view these plants and animals. 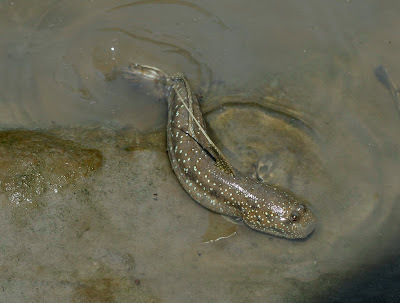 Perhaps our own wetland authority can exchange a thing or two of ideas with Tanjong Piai National Park authority in the areas of conservation and wise use of our own wetland.